How much does it cost to "Get A Goalie"? We charge an introductory flat rate of $35. Many other such services charge per hour and have additional charges for every 15 minutes thereafter. How quickly do you respond to a request? Generally within 30 minutes of receving the text/email/call. Goalies are not booked until payment is received! 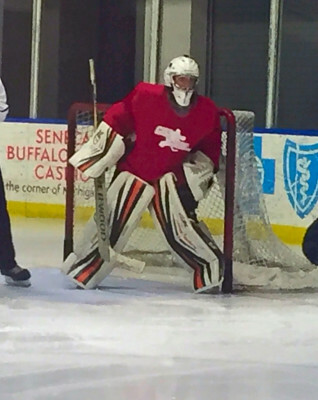 Every effort will be made to book and confirm your goalie in time for your skate or game. We frequently book/confirm in just minutes, sometimes it takes about an hour, but on occasion it may take longer. How much notice do you need for a booking? Although we can fill/have fiilled openings with less than an hours notice, DO NOT LEAVE THINGS TO CHANCE! 4 hours or greater will virtually guarantee a goalie for your skate. I need a goalie ASAP. Can you help? Great question and yes we can! If you need Instant/Emergency booking access just text/call. We will make every effort book you a goalie right away. -Please note that if a booking is cancelled within 2hrs of puck drop, we may not be able to reach our goalie in time. -If we cannot reach our goalie and they show up to play when you no longer need them- we ask that you pay them $20 directly for travel/gas time. We currently accept payments digitally by Square Cash, PayPal, and Venmo (Facebook). Don't have a Square Cash/PayPal/Venmo account? NO PROBLEM! We can send you a PayPal invoice to pay with a credit card even without an account!! Is there any kind of guarantee? What if the goalie is a sieve? Please keep in mind that anyone can have a bad game, but if you’re not happy with any aspect of our service, let us know and we’ll make sure your next rental is a much better experience. To eliminate any problems- we evaluate all our goalies before they join our team, so we know exactly what level they’re capable of playing. We then make every effort to match an appropriate goalie with the level of the skate (keep in mind that this may not be possible for a last minute Emergency Booking). Can I contact the goalie directly? It is our strict policy that you DO NOT ask for the goalies contact info in order to call him/her directly. If you are unsure of your goalies whereabouts before game time please call us in order to resolve the issue. We will be the fastest to contact the goalie and find out where they're at. Can we request the same goalie again? Yes! Simply ask for the goalie by name and we will try to accomodate. Please be advised that there may be some scheduling conflicts that may prevent the same goalie from attending your skate. Can I use a goalie from GetAGoalie.com for a whole season? We can certainly accomodate these situations, and offer heavily discounted rates. Please contact us regarding these types of requests. I'm a goalie, how do I sign up? Check out the Be A Goalie page for details about applying as a goalie with GetAGoalie.com. We are always looking for more goalies! We’ll review your application and let you know ASAP if we’d like you to join. Keep in mind that you need to be 18yrs of age and currently registered with USA Hockey. No, it’s free to join our service. However, we don’t accept just anyone so please review our requirements before signing up. It really all depends on you. We mainly have a first come first served process when filling games. We don’t call goalies directly (it’s just too time-consuming). We send out game notices to groups of goalies who's ability/experience levels match the needs of the booking. How do I get paid if I work for GetAGoalie.com? We pay our goalies using the same digital methods that we use to accept payments from our customers- Square Cash, PayPal, and Venmo (Facebook). If your question has not been answered, please visit our "Contact Us" page and we’ll be happy to get back to you asap.